Cavendish (right) came in for criticism. ANDRE GREIPEL WON the second stage of the Tour de France after a dramatic sprint finish this afternoon. 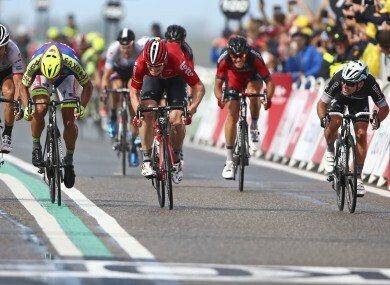 Greipel edged out Peter Sagan in the sprint finish with Fabian Cancellara third, and Mark Cavendish fourth. Cavendish came in for a lot of criticism after the race for making an early sprint from 200 metres out, eventually finishing fourth, resulting in his teammate Tony Martin missing out on the yellow jersey. Never been one to mince his words, Cavendish let everybody know just what he thought of their criticism on Twitter afterwards. ...computer game. Problem is, social media & TV are platforms for them to be heard. Gutted for @tonymartin85. Congratulations @AndreGreipel. By finishing third ahead of Cavendish, Cancellara’s four-second time bonus allowed him to take the yellow jersey instead of Tony Martin. The weather conditions played a big part in the 166km run from Utrecht to Zélande with the howling crosswinds and heavy rain, as you can see below, making things difficult on the route. Of the Irish, Dan Martin and Sam Bennett both finished in the pelaton one minute and 28 seconds back from the winners, while Nicholas Roche came in in 93rd place, four and a half minutes off the winner, Greipel. It leaves Martin 57th overall and Bennett 85th (both +3′ 14”), while Roche is in 105th place (+5′ 47”). Email “Cavendish hits out at social media "imbeciles" after failed attack on Day 2 of Tour”. Feedback on “Cavendish hits out at social media "imbeciles" after failed attack on Day 2 of Tour”.